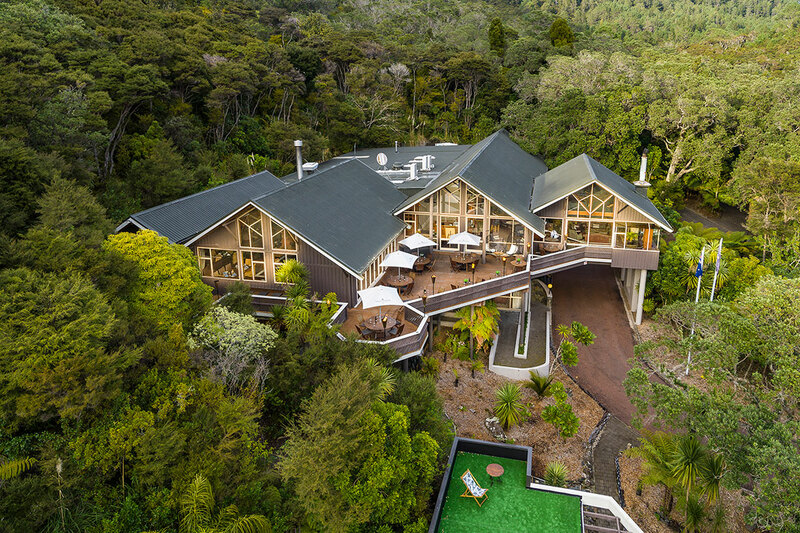 Located in a majestic location at Pauanui Beach on the Coromandel Peninsula, Grand Mercure Puka Park Resort will captivate your senses as you relax and enjoy its exquisite mountainside setting. Set amongst 25 acres of native bushland with tranquil ferny paths leading to premier chalet accommodation, the resort offers ample space, peace and privacy for you to absorb the natural beauty of the locale. Soak up the therapeutic benefits of the spa and sauna, or lounge beside the heated pool with picturesque views of the Coromandel Ranges in the background. For the actively inclined, there is an on-site tennis court, fully equipped gym and mountain bikes available for hire. Enjoy the relaxed, lodge style ambiance of the main building which includes the award winning Miha restaurant and a vast sunlit deck backdropped by unsurpassable views from high above the treetops. While away the hours in the sublime comfort of the guest lounge, featuring fine artifacts, a majestic fireplace, an elegant bar and sumptuous furnishings. Grand Mercure Puka Park Resort provides stylish and secluded accommodation with the ease of exceptional facilities right at your doorstep. Expect a Grand experience at Grand Mercure Puka Park.